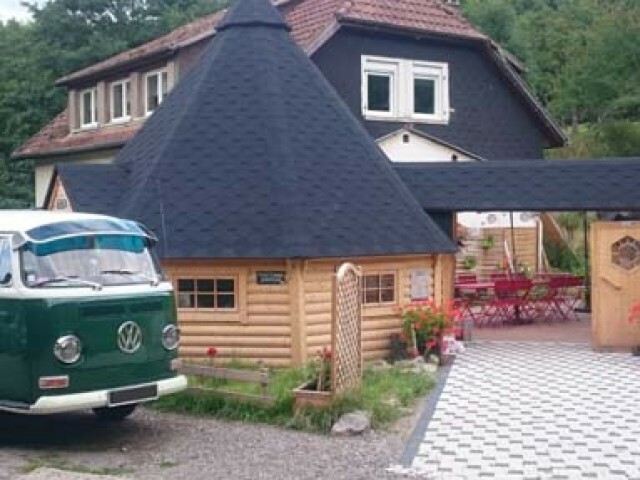 Located in the small village of Mitzach, Carole and Christian welcome you in their Restaurant Auberge P'ti Fermier and offer traditional Alsatian and mountain cuisine and according to unusual season. They reserve you a warm welcome and a family atmosphere. Walk through the door of this unique inn in a beautiful Finnish Kota with a rustic and warm decoration with a capacity of 20 seats and a card renewed regularly over the seasons and products from short circuits, mostly homemade dishes. Carole and Christian are waiting for you for a pleasant moment with your family, alone or as a couple for the pleasure of the taste buds. Come discover their unusual accommodation if you want to take a longer break and enjoy their ice cream and sorbet production.